The top of the range UP-5700 features a full colour TFT LCD touch screen from Sharp, the world leaders in LCD technology, and has been designed to suit retail and hospitality environments alike. 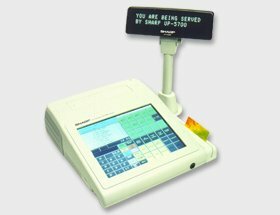 The obvious attraction of the UP-5700 is the 10.4 LCD back-lit colour screen, with excellent screen quality As touch screens are now accepted as the most natural way of interacting with computers this is the perfect opportunity for you to create an error free environment for your staff. The UP-5700 has the flexibility to adapt to any surroundings  be they retail or hospitality. In a retail environment the UP-5700 interfaces to industry standard barcode scanners and peripherals bringing you speed, accuracy and reliability in one sophisticated system. Integration with hotel PMS packages make the UP-5700 ideal for the hospitality sector. The high product file capacity of up to 500 000 PLUs allows the UP-5700 to cope with the most rapidly expanding business. With the facility to transfer data into other software packages, network connectivity and remote access, the UP-5700 is the perfect choice for todays cost conscious business. The UP-5700 is based on open systems architecture, which allows you to easily connect to industry standard peripherals. The UP-5700 will become the integral part of your total business solution when linked to third party software. This enables masses of information to be presented in an easily digestible form allowing you to make prudent management decisions. As you would expect from such an advanced model the UP-5700 is styled to match its performance with a small footprint, which takes up a minimum of your valuable space. Not only is the UP-5700 sleekly ergonomic but it is also durable enough to withstand the harshest of trading conditions. Whichever way you look at, the UP-5700 passes the test with flying colours.